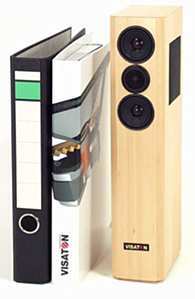 The VOX 80 is a three way bass reflex speaker, suggested by Visaton and supplied by us as a kit. It comes with crossover components and a F8 SC bass driver to be mounted sidewards. On the front, the CP 13 tweeter is flanked by two FRSW 5 R midrange drivers. Quite suitable for small home cinema systems and computers. since an electrolytic capacitor doesn't generate enough transparency. In series to the 3.3 mH coil (dotted frequency response curve pictured above right).